I was very excited to watch The Void. 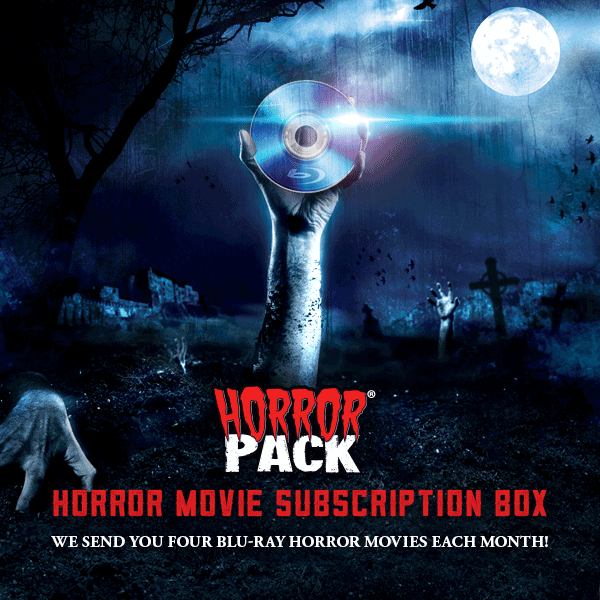 I closely followed the Kickstarter campaign, eagerly gobbling up each new trailer writer/director duo Steven Kostanski and Jeremy Gillespie released. Cults? Gore? Tantalizing, ‘80s–style, fully analog, bloody, monstrous costume design? Hell yeah, sign me up. The opening sequence hooked me. We’re staring at a pair of bloody–jean–clad legs laying on an old hardwood floor. They’re positioned in that ultra–specific dead guy way that lets us know immediately that there’s no need to show us the rest of his body for confirmation. We find the door and break out of the house, running. James (Evan Stern), who we will formally meet later, stumbles in front of the farmhouse but continues on. He turns around for a second, just long enough to see a girl run out of the house behind him. But she’s being closely pursued by two men, one of whom is carrying a gun (Daniel Fathers). James takes off, and the girl is shot in the back. As she writhes on ground in that disturbing “I still want to crawl away, but I was shot in the back so I really can’t” kind of way, the younger, gunless fellow (Mik Byskov) douses her with gasoline. 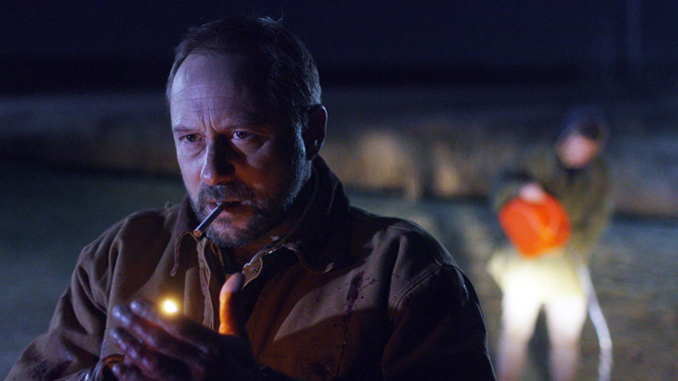 The gunman lights a cigarette. We all know what that is for. Back in my living room, my heartbeat is quickening. My palms are moistening. Let’s do it, I’m ready. And for the next thirty minutes or so, I remain very invested. Unfortunately, my excitement does start to taper off sometime after that 30–minute mark, when things become a little too convoluted. I really wanted to love The Void. And some parts of it did deliver. It is the homage to Lovecraft and Carpenter that it promised to be, and the fangirl within me was mostly satisfied with that. It also really shined in the visuals department. 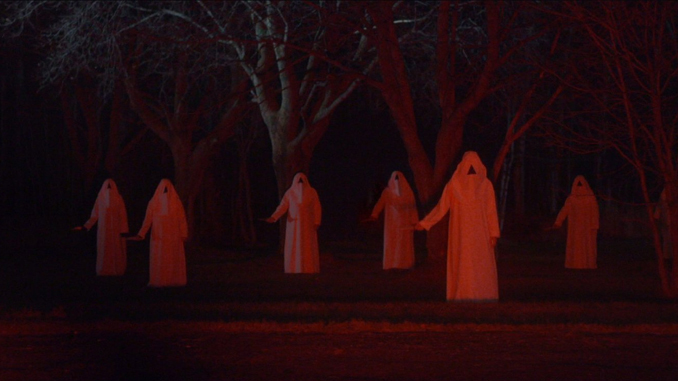 A lot of the shots, especially those featuring the hooded cult people standing in oddly pleasing formations in the hospital parking lot brandishing their kitchen knives, were aesthetically very scary, and that should be appreciated. 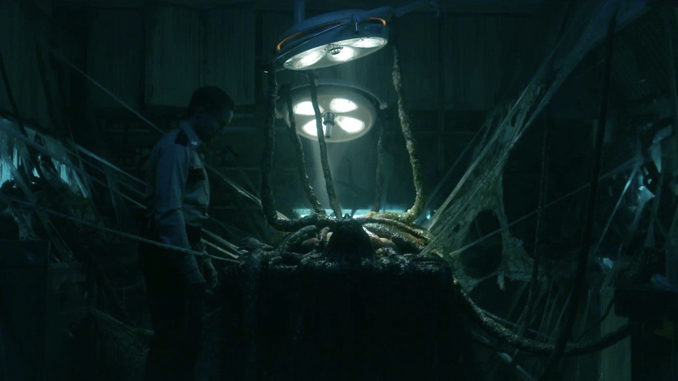 I also happen to love gory monsters not born of CGI wizardry, and The Void absolutely delivered with squeal–inducing scenes of slimy, spurting, tentacle–waving monstrosities. I loved it. And I will say that Kostanski (the makeup artist) and Gillespie (the visual designer) did do their damnedest to construct a captivating story around their wonderful visual set pieces. They just happened to fall a little short. 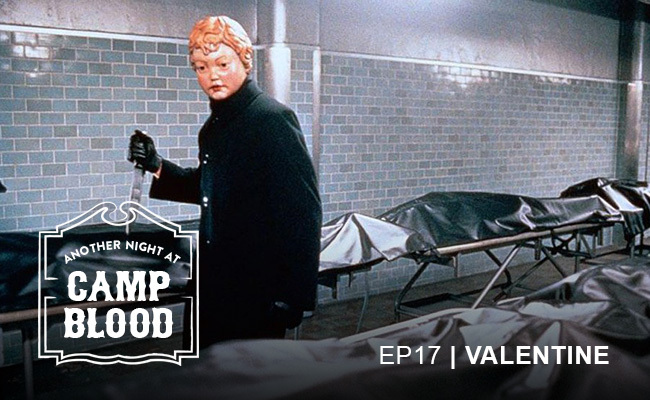 There was honestly too much going on without a lot of realistic reasoning and the connective tissue necessary to keep me particularly enthused about the plot. There were cult members, there were monsters, and there was a weird time–bending portal situation, but I never really found out what all of those things had to do with another. It feels like a film that fell into the trap of ambition, and unfortunately, that did sour the experience a bit for me. I can’t help but think that if The Void didn’t try to do so many things, it could have succeeded in more than just the refreshingly authentic gore category. Oh, well. I’d still give a solid three out of five.